Are Your Wedding Dreams Getting Lost in the Wants and Wishes of Everyone Around You? - Parenting Expert, Susan Newman Ph.D. Are Your Wedding Dreams Getting Lost in the Wants and Wishes of Everyone Around You? - Parenting Expert, Susan Newman Ph.D.
Are Your Wedding Dreams Getting Lost in the Wants and Wishes of Everyone Around You? Bickering bridesmaids, bossy vendors, your mother’s unsolicited advice, your fiancé’s (or his parents’) growing financial concerns—it’s enough to make any happy couple want to elope. In an effort to keep everyone, from your future-in-laws to your family and friends, happy, you agree to whatever they suggest, ask, or demand. When you can’t say “no,” planning your wedding can become an ongoing hassle that adds stress to an already stressful situation. There’s a way to sidestep wedding-related stress and feel rested and excited as you begin life with your new husband. The solution lies in one simple word—“no.” Once put into action, the power of “no” is limitless. It eliminates the need to push yourself to the max or to settle for someone else’s idea of what’s right for you. But even as you become aware of dwindling time and resources, refusing requests can seem an impossible task. Here are 10 tips adapted from The Book of NO: 250 Ways to Say It–and Mean It and Stop People-Pleasing Forever to ease the awkwardness and difficulty of saying “no”; they will help you cope with wedding demands (and way beyond). With these in mind, you’ll able to say “no” — and mean it — and along the way find pre-wedding overwhelm and upset and wedding day exhaustion and tensions fading away. 1. When approached with a request, pause to analyze what is really being asked of you. 2. Allow other people to take over once you’ve decided how you want your wedding to be. Because you vetoed calligraphy doesn’t mean you have to address all the invitations yourself. You want your special day to be perfect, but no matter how much of a “Superwoman” you are, it’s impossible to organize and execute the whole thing on your own. 3. When you say “yes” to something, wedding dress shopping with your mother or sister, for instance, be very specific about the dates and time you can be available. Two hours of dress shopping might be fun and productive…four hours might be torture for you. Learn to be protective of your time—it’s a valuable commodity that you have in limited supply. When you say “yes” continually to others, you say “no” to yourself and relegate yourself to second position, fourth, or even last. Even if it’s an outing you are excited about, consider your time restraints. .
4. Don’t be wishy-washy about decisions that involve changes to expected rituals. Stand strong when changing a tradition. People are not mind readers. No one knows that you object unless you say so. There is nothing wrong with wanting to have your wedding on the beach instead of at your in-laws’ golf club—the location for the marriages of all their other children. Breaking a long-standing tradition will be hard at first, but once you’ve said “no,” you’ll get the support you want. 5. Don’t back-up a “no” with a lie or pad it with lame excuses. It will just result in guilt and possibly hurting someone you care about. You are entitled to your preferences and to act on them, but that doesn’t give you an excuse to lie. Don’t tell a friend who asks to be in your wedding that you haven’t chosen your bridesmaids yet (when you have). It will only hurt more in the long run, if your lie is uncovered. 6. You’re in charge; you call the shots. 7. Your tone of voice and body language are far more influential in sending your “no” message than the actual words. The word “no” said politely is enough to convey your message. The less excuses you make, the stronger the message. Just don’t forget to say “no” with conviction to the photographer who insists on black and whites when you’ve already committed to all the photography you can afford. Look the person in the eye to let him know that you mean it and that pressure is useless. 8. Alter a request to make it, or part of it, more manageable. If a bridesmaid asks for help deciding how to do her hair and make-up for your big day, and you want to help, but you have a million other things on tap, tell her you’ll help with her hair, but the make-up will have to wait for another day. Most people will be appreciative for any help you are willing to provide. If you’ve handled the situation calmly, the backlash will be absent or insignificant. Remember: in general, people don’t think about you as much as you worry about what they think. While you’re feeling guilty, they are busy finding someone else to do the job. 10. Most importantly, you can say “no” and still remain a loving, committed person. 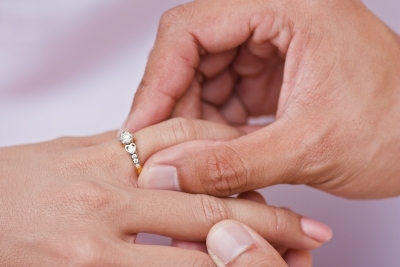 Most people understand and are forgiving, especially about wedding issues. And, if they’re not, do you really want them in your life? Remind yourself daily that “no” is liberating and gets you what you want. To say “no” is your right. As your wedding day approaches, you have other rights you will want to exercise such as making your feelings and desires known, establishing and guarding your boundaries, and keeping your need for rest, exercise, and balanced meals in the forefront of all you do… and don’t do. 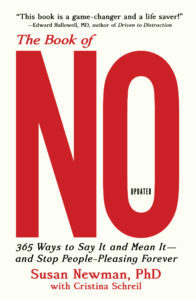 The word “no” is the only stress-buster you’ll need to live happily ever after.